Early voting in our latest FenwayNation Poll shows that a majority of readers (a combined total of 75%) want the Red Sox to pursue some form of the free-agency route instead of a trade for Giancarlo Stanton. As the chart shows, the highest level of support (45%) goes to the signing of both J.D. Martinez and Carlos Santana. 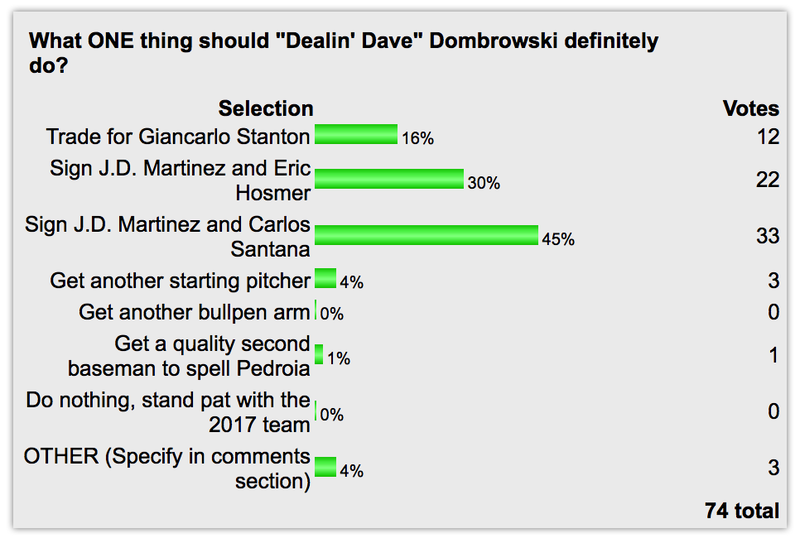 The next highest support (30%) goes to another version of free-agency—signing Martinez and Eric Hosmer. 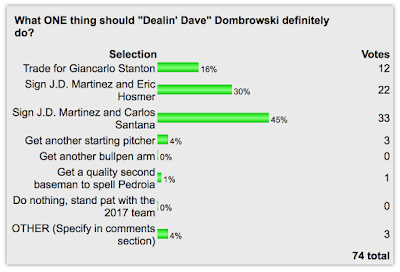 Somewhat surprisingly, only 16% support a trade for Stanton. Just 4% think getting another starting pitcher in the one thing Dave Dombrowski needs to do, while 1% see getting a short-term replacement for the injured Dustin Pedroia as a priority. Also, 4% want some other priority than those listed. You can still vote HERE.